With all the tropical storms hitting the South this year and the few stories this summer of the wind catching beach umbrellas and hurting people, My Umbrella Shop thought it would be a good idea to post a few safety tips about your beach umbrellas and patio umbrellas. If it’s windy, take it down. There is no sense in risking damage to someone else, your patio, home, or even your umbrella by leaving it up when it is windy outside. 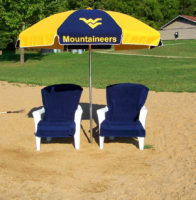 Beach umbrellas and patio umbrellas are designed to be closable. If it’s that windy, it’s unlikely that you will need it for protection from the sun or will even be sitting under it. Once closed, secure it somewhere it will not blow away. Do yourself, and others, a favor and take down the beach umbrellas and patio umbrellas when it’s windy. If it’s only slightly windy, anchor it securely. A beach umbrella or patio umbrella can create a great environment of relaxation, enjoyment, and entertainment. But, if it is slightly windy, our first advice is to close it and secure it. But if you must have a beach umbrella to protect you from the sun (and who doesn’t enjoy one? ), be sure to anchor it securely in the sand. Please read our article about “Anchoring Your Beach Umbrella.” Even a good anchoring may not secure your beach umbrella from a sudden surprise gust of wind. 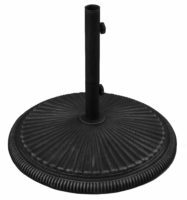 If using a patio umbrella, be sure to secure it with an umbrella base designed for your umbrella. Inserting your umbrella in a patio table designed for it is also a secondary way to anchor it in place. Regardless, do not underestimate Mother Nature. Strong gusts of wind can overcome the best base and table combination. Err on the side of safety. Beach umbrellas and patio umbrellas can create a wonderful space to enjoy fresh air and the great outdoors while protecting yourself from the harmful and overheating rays of the sun and even light rain, but at My Umbrella Shop, we want you to use your umbrellas safely and securely for years to come.